Nollywood movie trailers are inherently hard to understand. You know I’m right. Go to YouTube and see for yourself; it’s all there, embarrassing. It’s pathetic that in 2018, most filmmakers in Nollywood don’t know how to execute a trailer, preferring to assaulting viewers with loud noise and disorienting drama. Often, they come with high energy or as a sleeping pill. Either way, the art of making trailers that carry the utilitarian purpose of inducing mass anticipation for a movie is lost on Nollywood. Which is why the trailer for King of Boys, a movie directed by Kemi Adetiba, still deserves attention. And, by virtue of this piece, a little scrutiny. Released in August after months of carefully keeping details of the movie under wraps, and a teaser that propelled the movie’s press run but still stuck to giving nothing away, King of Boys had social media running wild and anticipation for the movie officially began. I also tweeted about it, but please pretend it’s not me. Kemi Adetiba teaching these Nollywood people how to make a trailer with King of Boys. I stan. I’ll analyse the trailer, but a little refresher on what the movie is about. 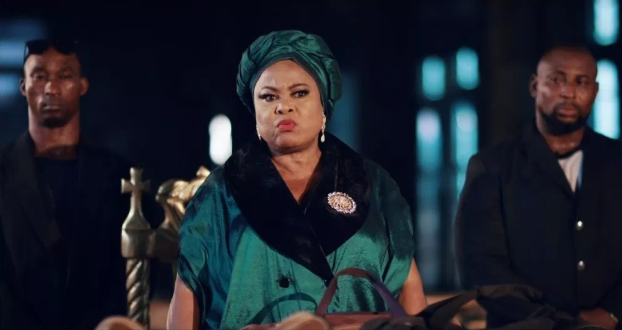 Per the synopsis on the movie’s website, Alhaja Eniola Salami is a businesswoman and philanthropist with a checkered past and a promising political future. First, this is very resonant as we approach the 2019 elections in Nigeria. A woman vying for power, this is it. The plot also indicates a power struggle Salami will face and the compelling need for her to be cunning and ruthless. And this was what the trailer essentially encapsulated. By now, you must know that Sola Sobowale is Salami and she isn’t really smiling. Adetiba served a trailer that largely played on mood and atmosphere, expository just as much as it was cryptic. It was a lovely balance between seeing a matriarchy revolving around Sobowale’s character and a world that would try to resist her. It also had a sound effect that amplified the movie’s dread. Yesterday, Adetiba announced via Instagram that King of Boys will exclusively premiere on October 21, followed by an October 26 date for public consumption. Adetiba sold King of Boys and the public bought it. Take notes, Nollywood.